Mamahood, Among Other Things...: Zoë's "Par-dy"
Although there are three more days of school holidays left, which means that I have to keep both kids entertained, I am definitely not as stressed out as I was last week, when I was running around trying to make sure that I had everything I'd need for Zoë's party. Given that the decision to throw her a party was pretty last-minute and considering how disorganized I've been, Zoë's birthday party turned out quite well. Happy me. Happy Zoë. Happy kids. Happy me again. Good thing we held the party at the Clubhouse instead of at the beach, because it poured that afternoon. I wanted to keep the party small to keep things more manageable (for me! ); plus I felt bad for the very last-minute invite that I'd sent out invitations only to a few close friends. For activities, I decided to do "artsy" activities --something that will keep the kids entertained without me having to sing and dance or hop around. We started with cupcake decorating. I made strawberry cupcakes and cream cheese frosting. Personally, not my favorite (I'm more a muffin girl), but they were a hit. We had rainbow sprinkles, mini M&Ms and other fun cake decoration stuff for the kids to play around with. That kept the kids busy and allowed me to chat a bit with the mommies. Now that it's over, I can say that I had fun preparing for it. 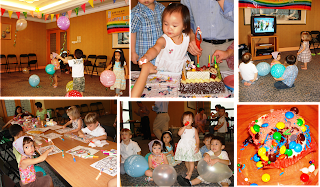 The best part was seeing the kids really enjoy themselves at the party. Postscript: We had another cake on Zoë's actual birthday. I ordered a plain chocolate cake (really yummy!) with just Zoë's name piped on and then we "decorated" the cake ourselves. This is something that I'll probably do more of with the kids, seeing as they had so much fun. I can already see my waistline and hips ballooning... way bigger than they already are! I love the cake idea. Very clever and I bet she loved it! Looks like so much fun - and the cake is awesome.